If you've been reading the CocktailMom Blog for a while you know that I'm a huge fan of thank you cards. I think sitting and writing a handwritten thank you note is such an important lesson for parents to teach their children. Not only does it develop their handwriting and letter writing abilities but it also teaches them to acknowledge thanks and to be mindful of living life with compassion to others. Here are a few of Logan's previous thank you cards over the years; Age 7, Age 6, Age 5. 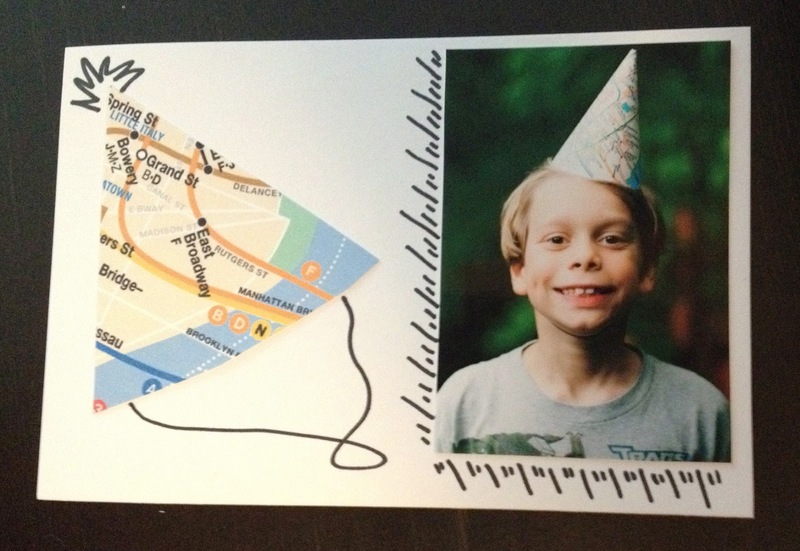 This year Logan had a New York themed birthday party and we made party hats out of MTA subway maps that I printed onto card stock. Using the leftover scraps of paper from the party hats I made small party hats to adhere to white card stock and decorated with a black sharpie. All of the birthday party thank you cards includes a current photo of the child. And Logan wrote on the back of each card thanking the person for his gift and coming to his party. If you don't already send out thank you notes, have your children start this holiday season. It's never too late to begin a new tradition.